Annatto (/əˈnætoʊ/ or /əˈnɑːtoʊ/) is an orange-red condiment and food coloring derived from the seeds of the achiote tree (Bixa orellana) native to tropical regions from Mexico to Brazil. It is often used to impart a yellow or orange color to foods, but sometimes also for its flavor and aroma. Its scent is described as "slightly peppery with a hint of nutmeg" and flavor as "slightly nutty, sweet and peppery". The annatto tree B. orellana is believed to originate in tropical regions from Mexico to Brazil. It was probably not initially used as a food additive, but for other purposes such as ritual and decorative body painting (still an important tradition in many Brazilian native tribes, such as the Wari'), sunscreen, and insect repellent, and for medical purposes. It was used for Mexican manuscript painting in the 16th century. Annatto has been traditionally used as both a coloring and flavoring agent in Latin America, the Caribbean, the Philippines, and other countries where it was taken home by Spanish and Portuguese explorers in the 16th century. It has various local names according to region. Its use has spread in historic times to other parts of the world, and it was incorporated in local culinary traditions of many countries outside the Americas. Ground annatto seeds, often mixed with other seeds or spices, are used in the form of paste or powder for culinary use, especially in Latin American, Jamaican, Belizean, Chamorro, Vietnamese, and Filipino cuisines. In Mexican and Belizean cuisines, it is used to make the spice recado rojo. In Venezuela, annatto is used in the preparation of hallacas, perico, and other traditional dishes. Pasteles and sazón in Puerto Rico also contain annatto. Annatto paste is an important ingredient of cochinita pibil, the spicy pork dish popular in Mexico. It is also a key ingredient in the drink tascalate from Chiapas, Mexico. In the Philippines, it is used for the sauce of pancit. Annatto is used currently to impart a yellow or orange color to many industrialized and semi-industrialized foods. In the European Union, it is identified by the E number E160b. Annatto has been a traditional colorant for Gloucester cheese since the 16th century. During the summer, the high levels of carotene in the grass would have given the milk an orange tint which was carried through into the cheese. This orange hue came to be regarded as an indicator of the best cheese, spurring producers of inferior cheese to use annatto to replicate it. 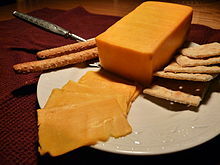 The custom of adding annatto then spread to other parts of the UK, for cheeses such as Cheshire and Red Leicester, as well as colored Cheddar made in Scotland. Many cheddars are produced in both white and red (orange) varieties, with the latter being more popular despite the only difference between the two being the presence of annatto as a coloring. That practice has extended to many modern processed cheese products, such as American cheese and Velveeta. The yellow to orange color is produced by the chemical compounds bixin and norbixin, which are classified as carotenoids. The fat-soluble color in the crude extract is called bixin, which can then be saponified into water-soluble norbixin. This dual solubility property of annatto is rare for carotenoids. The seeds contain 4.5–5.5% pigment, which consists of 70–80% bixin. Unlike beta-carotene, another well-known carotenoid, annatto-based pigments are not vitamin A precursors. The more norbixin in an annatto color, the more yellow it is; a higher level of bixin gives it a more orange shade. In the United States, annatto extract is listed as a color additive "exempt from certification" and is informally considered to be a natural coloring. Foods colored with annatto may declare the coloring in the statement of ingredients as "colored with annatto" or "annatto color." Annatto condiments and colorants are safe for most people when used in food amounts, but they may cause allergic reactions in those who are sensitive. In one 1978 study of 61 patients suffering from chronic hives or angioedema, 56 patients were orally provoked by annatto extract during an elimination diet. A challenge was performed with a dose equivalent to the amount used in 25 grams (0.88 oz) of butter. Twenty-six percent of the patients reacted to this color four hours after intake, worse than synthetic dyes such as amaranth (9%), tartrazine (11%), Sunset Yellow FCF (17%), Food Red 17 (16%), Ponceau 4R (15%), erythrosine (12%) and Brilliant Blue FCF (14%). Annatto is not among the "Big Eight" substances causing hypersensitivity reactions (cow's milk, egg, peanuts, tree nuts, fish, shellfish, soy, and wheat), which are responsible for more than 90% of allergic food reactions. The Food and Drug Administration and experts at the Food Allergy Research and Resource Program (FARRP) at the University of Nebraska do not include annatto in the list of major food allergens. As annatto is a source of tocotrienols, such as geranylgeraniol—compounds similar in structure and function to vitamin E—its extracts were under preliminary research as of 2015[update] to determine their potential biological properties in humans. In one such application, annatto geranylgeraniol is an ingredient in an experimental medical food being investigated for its effect on blood lipoproteins. ^ a b c d "Bixa orellana (annatto)". CABI. 27 September 2018. Retrieved 14 October 2018. ^ "Encyclopedia of Spices". TheEpicentre.com. Archived from the original on 17 January 2010. Retrieved 24 August 2011. ^ Smith, James (2006). "Annatto Extracts" (PDF). Chemical and Technical Assessment. JECFA. Retrieved 3 February 2012. ^ a b Myles, Ian A.; Beakes, Douglas (2009). "An Allergy to Goldfish? Highlighting Labeling Laws for Food Additives". World Allergy Organization Journal. 2 (12): 314–316. doi:10.1097/WOX.0b013e3181c5be33. PMC 2805955. PMID 20076772. ^ "Bija – Achiote". Indio.net. Archived from the original on 24 July 2011. Retrieved 24 August 2011. ^ "Jamaican Annatto". GetJamaica.com. Archived from the original on 11 July 2011. Retrieved 24 August 2011. ^ Smith, Nigel J.H. (2005). "Geography of Crop Plants" (PDF). Geo 3315, Lecture Notes: Part 2. Department of Geography, University of Florida. Archived from the original (pdf) on 22 September 2007. ^ Lovera, José Rafael (2005). Food Culture in South America. Food Culture Around the World. Greenwood Publishing Group. p. 51. ISBN 978-0-313-32752-0. Retrieved 24 August 2011. ^ "Colorants Used During Mexico's Early Colonial Period". Stanford University. 1997. Archived from the original on 20 March 2008. Retrieved 24 August 2011. ^ "Common Spices in Modern Philippine Recipes". PhilippinesInsider.com. Archived from the original on 15 July 2011. Retrieved 24 August 2011. ^ "British Cheese Board". BritishCheese.com. Archived from the original on 26 July 2011. Retrieved 24 August 2011. ^ "'Sorry Ireland: 'Red cheddar' doesn't really exist'". DailyEdge.ie. Archived from the original on 25 July 2015. Retrieved 8 December 2015. ^ a b "Executive Summary Bixin" (PDF). National Institute of Environmental Health Sciences. National Institutes of Health. November 1997. Archived from the original on 21 July 2011. Retrieved 24 August 2011. ^ Smith, James; Wallin, Harriet (2006). "Annatto Extracts: Chemical and Technical Assessment" (PDF). FAO. Retrieved 10 June 2013. ^ Kuntz, Lynn A. (4 August 2008). "Natural Colors: A Shade More Healthy". Food Product Design. Virgo Publishing, LLC. Retrieved 26 January 2013. ^ "Title 21 Code of Federal Regulations part 73". U.S. Government Printing Office. Retrieved 24 August 2011. ^ "CFR Title 21". U.S. FDA. 1 April 2011. Retrieved 24 August 2011. ^ "21CFR101.22". Code of Federal Regulations Title 21, Volume 2. FDA. 1 April 2011. Retrieved 7 March 2012. ^ "ANNATTO: Uses, Side Effects, Interactions and Warnings". WebMD. 30 July 1999. Retrieved 24 August 2011. ^ Magee, Elaine (9 July 2010). "What's Up With Food Dyes?". Healthy Recipe Doctor. WebMD. Retrieved 24 August 2011. ^ Mikkelsen, H; Larsen, JC; Tarding, F (1978). Hypersensitivity reactions to food colours with special reference to the natural colour annatto extract (butter colour). Archives of Toxicology. Supplement. Archives of Toxicology. 1. pp. 141–3. doi:10.1007/978-3-642-66896-8_16. ISBN 978-3-540-08646-8. PMID 150265. ^ "AllergenOnline Database". University of Nebraska-Lincoln. Retrieved 3 February 2012. Allsop, Michael; Heal, Carolyn (1983). Cooking With Spices. Vermont, USA: David & Charles. Lauro, Gabriel J.; Francis, F. Jack (2000). Natural Food Colorants Science and Technology. IFT Basic Symposium Series. New York: Marcel Dekker. Lust, John (1984). The Herb Book. New York: Bantam Books. Rosengarten Jr., F. (1969). The Book of Spices. Pennsylvania, USA: Livingston Publishing Co.
Wikimedia Commons has media related to Annatto.